Weaponised Advanced Light Helicopter - Rudra | Source: Hindustan Aeronautics Ltd. Final price negotiations for are on for the Indian chopper fleet and the first firing is expected to be conducted on an LCH by the year-end. The Indian chopper fleet is set to get teeth, with the defence ministry initiating the final process of ordering new missiles for the Rudra. Developers are also planning a live firing of the air-to-air missile on the Light Combat Helicopter (LCH) by the year-end. India presently has two indigenous attack helicopter programs – the Rudra (a weaponised version of the Advanced Light Helicopter) which joined service in 2013, and a LCH that is under development, and set to be in service with both the Army and Air Force. A total of 78 Rudras have been ordered, with 23 of them already in service. The Rudra is currently armed with only a forward mounted machine gun and rockets, limiting its operational role in the battlefield. The helicopter will now be equipped with new anti-air missiles that will make it capable of taking down enemy choppers and UAVs. The Indian Air Force—which is the lead agency for integrating these missiles on the Rudra—has called French missile manufacturer MBDA for final cost negotiations to supply the Mistral missile for the fleet. “The contract negotiation committee will start in a few days. We had to do work on a few items before, which is now complete. We are fully compliant with the chopper,” Loic Piedevache, Country Head (India) of MBDA, said. Little has been heard about the Rudra fleet in the past few years, but its presence at the Nalia airbase in Gujarat was revealed during Defence Minister Nirmala Sitharaman’s recent visit during which she inspected the helicopter. The entire Rudra fleet, a majority of which will stay with the Army, will be armed with the Mistral missile. Talks are also on to procure an anti-tank missile for the fleet that will be fitted at a later stage. The plan to develop a highly agile combat chopper under the LCH program is also set to get a boost with MBDA saying that the helicopter will be undertaking a live firing of the Mistral missile before the end of this year. The LCH – 179 of which have been ordered – is currently under development and the integration of the Mistral missile will be a major milestone. The Mistral missile will also be a major milestone for the Rudra. 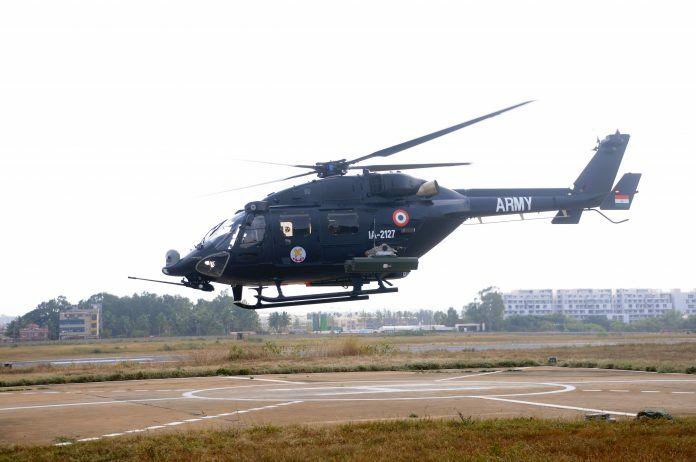 The LCH live firing will take place at the Chandipore testing range by year end and is expected to go smoothly as the Rudra and LCH share many systems including radars and the combat management system. Besides the Rudra and the LCH, the Army and the Air Force are also getting the Apache attack choppers that are manufactured in the US. Described as the ‘most lethal in the world’, six Apache helicopters were cleared for the army in August, in addition to 22 attack choppers already ordered by the Indian Air Force.